Starting in the 17th century, women in Mexico have been commenting on politics, history, society, and culture via their writing in newspapers, books, and magazines. Sadly, until recently, many haven’t been honored with the status conferred on their male counterparts. 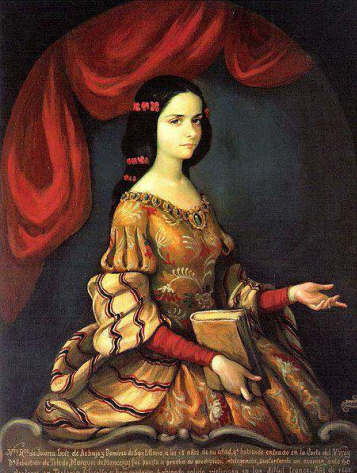 Here are five outstanding Mexican women writers, in chronological order beginning with Sor Juana, who planted the seeds for future women writers and thinkers. They are today’s heroes, both in Mexico City and throughout the country, and all are excellent examples for young women struggling with identity and choice. Many others deserve accolades, so consider this a brief selection of shining stars in a constellation of the intelligent women contributing to the salvation of the country. SOR JUANA (1651 or 1648, depending on the source-1695) had one goal in mind: the freedom to study. For this reason in 1669 she entered a convent to become a nun. She was cloistered there for the rest of her life, writing plays, poems, and sonnets. Sor Juana is known officially as the first published feminist in the New World (Mexico was still part of Spain during her life). Her works are available in English but lose something in translation. I recommend you read them in Spanish. Sor Juana died in the convent caring for other nuns during the plague. The most famous and interesting account of her life was written by Nobel Prize winner Octavio Paz, entitled Sor Juana or the Traps of Faith. Nellie Ernestina Campobello Luna is a little-known writer, dancer, and choreographer who was the only woman to publish narrations during the Mexican Revolution of 1910 to 1920. Her classic semi-autobiographical novel, Cartucho, is set in Chihuahua from 1916-1920, one of the bloodiest eras of the war. The book relates the stories and personal experiences of the people living there, and casts a rare favorable light on Pancho Villa. In 1985 Campobello disappeared, along with her paintings by Diego Rivera and Jose Clemente Orozco. It seems she was kidnapped and died in 1986. One of the most beloved authors of children’s literature and Mexican art and history, Anita Brenner, moved back and forth between Texas and Mexico during her childhood, but ended up settling in Mexico in her later years. The most famous of her books, written in 1943, is The Wind that Swept Mexico, a broad and detailed look at the Mexican Revolution and its consequences, covering the years 1910 to 1942, from the overthrow of Porfirio Díaz to the eras of Madero, Villa, Zapata, and Carranza to the social revolution of Lazaro Cardenas. The text is accompanied by photos and prints that have been meticulously assembled, cleaned, and re-photographed. Poniatowska’s mother’s family actually left Mexico for life in France during the Mexican Revolution. Then, when Elena was 10, during the Second World War the family left France to return to Mexico. Social and political issues dominate the books and novels written by this still very politically active writer. Probably the most famous of her books is La Noche de Tlatelolco (known in English as Massacre in Mexico), an account of the 1968 student protests and conflict with the military and police. More than 1,300 people were arrested, and while there is no firm figure on the number killed, estimates from 30 to 300. The conflict occurred just 10 days before the opening of the 1968 Summer Olympics in Mexico City. Poniatowska’s book is a compilation of eye-witness accounts. The fascinating, complicated life of Leonora Carrington, the well-known surrealist artist of the 20th century, is the subject of Poniatowka’s book Leonora. Carrington ran off with Max Ernst at an early age for adventure in France, and the book takes us from those days to her time in New York and eventual journey to Mexico, where she lived until her recent death at age 94. Ms. Poniatowska started her career as a journalist for the newspapers Excelsior and Novedades de Mexico. She continues to write and be published in the most prominent publications in Mexico, her name being a household word here. Political analyst, writer, and university professor, Denise Dresser is one of the most prominent critics of the current administration in Mexico. She writes a column for Reforma daily newspaper, contributes to Proceso, the popular weekly politically left magazine, and works as an associate for the Los Angeles Times.